0 Comments Published by KL Ocs Kid on Friday, June 4, 2010 at 8:01 AM. Were it simply a football decision, a detached analysis of where Liverpool should be in the midst of a debt-ridden power vacuum, then Rafael Benítez, for the many faults, facts and suspect full-backs, would not be leaving Anfield with a lucrative pay-off. But it is not simply football that has done for Benítez. It is the politicking that is as much a feature of the Spaniard's managerial career as European expertise and the misfortune to fall into the employ of Tom Hicks and George Gillett. The leverage buy-out experts promised a spade in the ground for a new stadium within 60 days of their arrival in February 2007 but have only dug the hole into which Benítez has now fallen. He moved closer to the exit with every refinancing deal the Americans secured while his reputation inevitably suffered with every transfer window without additional funds. Not that Benítez walks away blameless. In announcing the end of the manager's six-year reign Martin Broughton, the chairman parachuted into Liverpool from British Airways to lend gravitas to the sale of the club, and who could not attend the final home game of last season due to his Chelsea allegiances, stresses that football was behind the departure. No one would dispute Broughton's analysis of the "disappointing season" just gone but this was one dreadful campaign following five seasons of steady progress. The man who delivered Liverpool's fifth European Cup in such miraculous style in 2005 and the FA Cup a year later had enough goodwill left on the Kop to be allowed a shot at redemption. Circumstances inside the club, many Benítez-created, however, ensured that could never happen. It was only November 2007 when confirmation of an approach to Jürgen Klinsmann from Hicks and Gillett brought Liverpool supporters on to the streets in support of the former Valencia coach. On the back of two Champions League finals in three seasons, FA Cup success and the astute purchases of Fernando Torres, Javier Mascherano and José Reina, Benítez was untouchable in Anfield eyes. An Indian sign over José Mourinho's Chelsea in Europe didn't damage his cause either. His own discontent with the inner-workings of a club without the stadiums or resources of their main Premier League rivals was already surfacing, however. The morning after defeat to Milan in the 2007 Champions League final brought the first evidence of Benítez the agitator in Liverpool colours. He left Valencia owing to boardroom interference and transfer restrictions, famously stating: "I asked for a table and they brought me a lampshade." He had earlier fallen out with Jorge Valdano at Real Madrid over his input into the youth team. Now he was voicing frustrations inside Anfield. Prevarication on transfers, an underachieving commercial operation, lack of progress with a new stadium and being pressured to keep pace with clubs who could afford to make £20m mistakes on players; his protests were set to repeat until today's exit. Benítez's motivations were to improve Liverpool but, having won the battle to oust Rick Parry as chief executive and also secured a lucrative five-year contract with no release clause that also ceded to him control of an unproductive youth academy, he consolidated his own authority in the process. That left him exposed should Liverpool falter, and the Americans' financial problems combined with several expensive transfer mistakes made for a fatal concoction last season. The now former Liverpool manager justifiably raged against having to sell players before he could buy in recent windows, particularly with his squad finally emerging as genuine title contenders in 2009. In that restricted climate, however, he erred badly in marginalising Xabi Alonso and compounded the problem by replacing him with Alberto Aquilani, a talented midfielder no doubt but not, as he recovered from ankle surgery, the player needed to enhance Liverpool's title credentials. Starved of funds but not, until now, the will to fight, Benítez refused to be silenced on the financial problems, and relationships with the boardroom continued to fracture until the point where he had little support above him. Liverpool could not start next season with the same dysfunctional power structure in place and, with no sign of Hicks and Gillett selling up, the manager became increasingly isolated. The value of today's Liverpool squad is vastly superior to the one Benítez inherited in 2004 and may be the commodity that has prevented the Royal Bank of Scotland taking more drastic action against Hicks and Gillett. Perversely, however, Benítez inherited a Champions League team from Gérard Houllier and a ticket to his finest hour, the victory that guarantees allegiance among many supporters to this day, in Istanbul the following May. His successor is bequeathed a pass to the Europa League and a team that could struggle to emulate last season's seventh place finish should Steven Gerrard and Torres decide they have witnessed enough false promises and turn the Anfield exit into a revolving door. Before Benítez bit the bullet there were reports the Liverpool board were forced to act by a threatened dressing-room revolt should the manager stay. 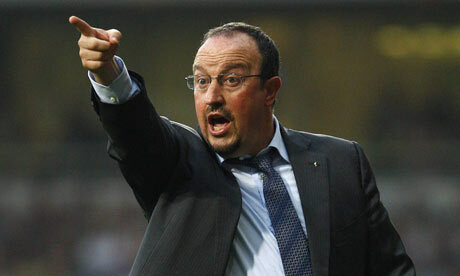 Gerrard, Torres and others, so the line goes, have questioned Benítez's management following the last, miserable season. Who hasn't? What is more pertinent to the futures of Liverpool's finest players – many of whom are aggrieved their names have been dragged into the argument – is the direction the club is taking and its ability to strengthen the squad to compete for the top honours once again. These were the very same assurances that Benítez wanted to hear in his recent meetings with Broughton. Unable to grant them, due to the on-going uncertainty at the top of the club, the Liverpool chairman was left facing a manager disillusioned with financial constraints, in dispute with most of the Anfield hierarchy and accepting that something had to give. That it was him, and not the American co-owners who are the root cause of Liverpool's implosion, will be a source of immense pain for Benítez.